A cancer survivor whose face was ravaged by a tumor, leaving him with a large hole where his eye, nose and cheekbone had been, has become the first person to receive a 3D printed face prosthesis made with a smart phone. 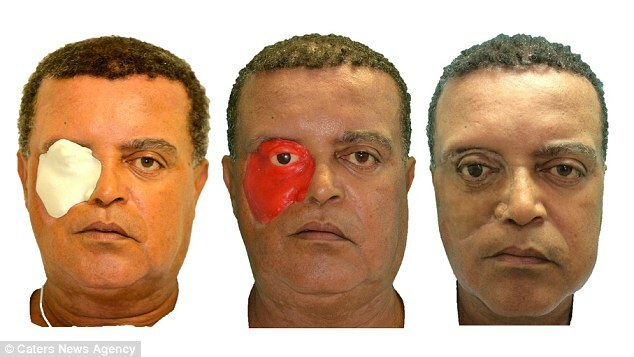 Married former salesman Carlito Conceiçao has lived with the hole and an uncomfortable prosthetic that kept falling off since 2008 – but now a ground-breaking procedure used a free app on a smartphone to build and print a 3D image of the missing part of his face. Researchers now hope to train as many people as possible to make the affordable and practical technology accessible in remote areas of the world where people have minimal health care services. Mr Conceiçao, 54, was diagnosed with upper maxillary carcinoma, an aggressive form of cancer in the upper palette of his mouth. The cancer spread rapidly, destroying facial tissue on the right side of his face and half of the roof of his mouth, as well as damaging his throat. Life-saving surgery halted the spread before it reached his brain, but when the tumour was removed, it claimed his right eye socket and part of his nose, sending him into depression. Since the surgery eight years ago, Mr Conceiçao – a father-of-two who used to be a salesman in Sao Paulo – has used an uncomfortable prosthetic that kept falling off.